When are NSL Services going to hire Kim and Aggie? 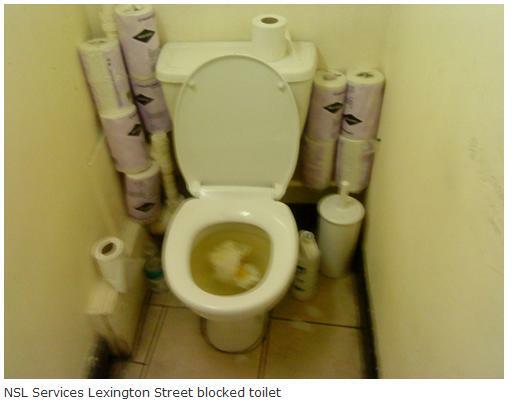 A couple of weeks ago, we published a post to show how disgusting the toilets and other facilities are at NSL Services’ Lexington Street base in Central London, where a large proportion of their Civil Enforcement Officers (CEOs) working in Westminster are based. NSL Services is the organisation to which Westminster City Council are currently outsourcing their parking control operations. Below is a quick reminder of what the toilet and washing facilities look like there, and you can click here should you wish to read our earlier post. 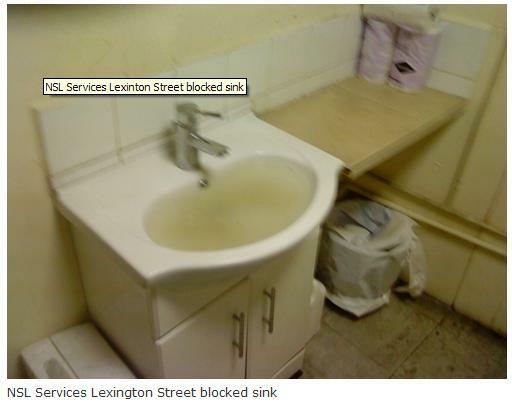 We have now found out that NSL Services treat their CEOs in pretty much the same way in Belfast (Northern Ireland), where the toilet floor would regularly be covered in urine from overflowing toilets. Does this sound familiar? Also, CEOs complained that they had to walk in the rain with leaking boots, men and women had to share changing rooms, and employees suffered from breaches of personal confidentiality and had to use faulty equipment to do their job. As a result, 26 CEOs, fed up with working in these atrocious conditions, decided to walk out for a half day stoppage. When they returned to work the following morning, they were given letters suspending them from duty and calling each to attend disciplinary hearings, and a few days later, the CEOs concerned received a letter advising them that they were dismissed from their job with immediate effect. This is how NSL Services treat their employees. Not only do they provide them with disgusting facilities to use, but also sack them should they decide to exercise their democratic and legal right to express their opinion and concerns, especially when it comes to point out how inhuman NSL Services are as an employer. The Company was in breach of the terms and conditions of the contract between the Department and NCP (now NSL Services) in relation to Health and Safety requirements. We are delighted to say that it was all a happy ending for the poorly treated CEOs, but what a nightmare these poor guys had to go through. But we wonder why Tim Cowen, Director of Communications at NSL Services, said about another issue affecting CEOs: “I am very disappointed that these guys feel that they have to complain to the press (…) Any of them can come to me in person or anonymously and I will listen to what they have to say”. Well, obviously not, otherwise these CEOs wouldn’t have been sacked for exercising their democratic and legal right to protest, don’t you think? Does this make you feel like you want to work for NSL Services? And let’s not forget that the contract between NSL Services and Westminster City Council is due for renewal in March 2010. Good luck, NSL Services! UK France Bikers.com wouldn’t exist if Westminster Conservative Councillor Danny Chalkley had not been treating motorcyclists like cash cows to generate additional revenue to push through his Partners in Parking (PiP) scheme, which is currently the subject of an investigation carried out by the Commission of the European Communities for potential breach of European Union law, and also a public inquiry that bikers demanded to the Department of Communities & Loal Government (DCLG) on 7th December 2009. 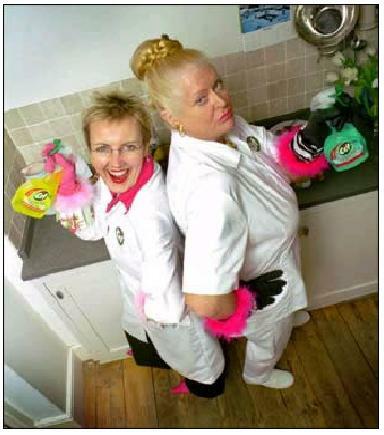 Anyway, how about Kim’s and Aggie’s next episode of “How clean is your house” taking place in the premises of NSL Services, where a thorough clean up seems to be well overdue? NSL Services may want to have a quick look at Kim’s and Aggie’s website to learn how to clean toilets and sinks, before these ladies come in and tell them off! Kim and Aggie from "How clean is your house?" Now we know why CEO’s all have such short tempers. You try going all day without going for a pee. That’s horrifying, how can a company treat its employees like this? It’s disgusting! Not only NSL Services should call Kim and Aggie urgently, but they should also really have a sanitary control procedure undertaken at their premises. I now understand why I saw a CEO peeing in the street recently! I was really horrified but it now makes perfect sense based on their working conditions. « Camden wouldn’t touch the bike parking tax with a bargepole, would they?